Riverview is the setting of my first novel, Blue Sky Days. It's a fictional town three hours north of Toronto, where my main character, Emma, grew up. When I started writing Blue Sky Days, I decided to create a fictional setting, because it gave me carte blanche - I could let my imagination run free, and I didn't have to do a ton of research on a town or city. I actually wrote a guest post about Riverview for the blog tour when the book came out in January for Obsession With Books, run by the amazing Sharon. 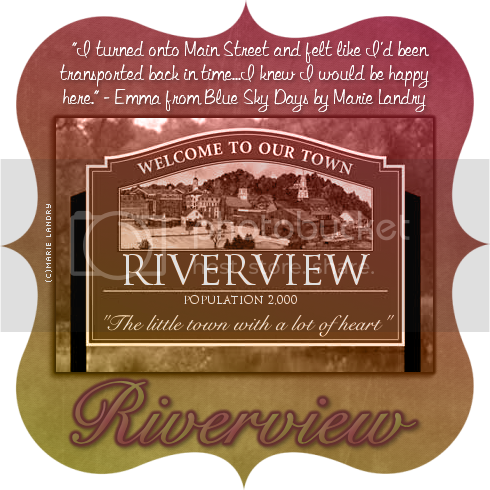 I had a lot of fun creating Riverview, because it was basically my ideal place - small, quaint, kind of old-fashioned, where everyone knows everyone else, but they're not all gossipy and involved in each other's business. I actually had one reviewer say it reminded her of Pleasantville, and even though I've never seen that movie, it made me laugh. I realize the town sounds a bit idealistic, but I know places like that exist, because I've visited them. The city I live in is actually surrounded by a bunch of charming little towns that are a lot like Riverview, and I also drew a lot of inspiration from Amherst Island, where my Grama was born and raised. My current WIP is set in Bellevue, Ontario, which is another fictional place, although this time it's based on a real city - my city. I changed the name of the city slightly, but all the streets are the same, and the businesses themselves are the same, but I've renamed them (everything is a play on the actual names of the businesses...I've had a lot of fun with that). I always mention actual cities so that people have an idea of where the place is - for instance, in Blue Sky Days, I mentioned Toronto quite a bit, since it's a well-known city. I've done the same in my new book, mentioning Toronto, Kingston, and Ottawa, and Bellevue's relation to them geographically. I really enjoy creating fictional places, and I think I'll continue to do it for future projects. I'm already coming up with a town for my next novel - figuring out the layout, the businesses, and where it's located. For me, it's always rewarding when someone tells me they loved Riverview and wish they could live there, because it's something I created. That alone is reason enough to keep creating fictional worlds. Do you write about fictional towns, or base your settings on real places? When you're reading, do you care if the setting is a real town or city? Moon Dance takes place in a town called Sterling Falls, where my Kindred used their powers to alter the landscape to their liking. The latter half of the book was tougher since I set it in Whistler B.C. since the climax I was working toward required an avalanche. Working in a real city is much more difficult then creating one! So relieved that my next book, Riptide, is taking place in the Mer beach town of New Haven, Florida, which is "near Daytona Beach". Creating the atmosphere of my Merfolk's underwater kingdoms as well as their settlement among humans is proving really interesting. Anyway, I hope all is going well with designing Bellevue (love the name, by the way). :) Have a great day! Stopping in from the A to Z Challenge and great to meet you! And I use real towns and real establishments. I will visit the restaurants and eat the same food the characters eat. Its a tough job but somebody has to do it.